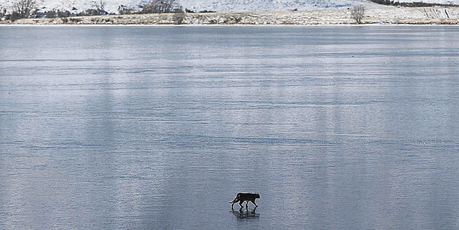 Mid-Canterbury's elusive black panther may have moved south. Last week a delivery driver spotted what he described as a large cat-like animal feeding on road kill just outside the Fairlie township in the early hours of the morning. The description was remarkably similar to reports in a number of sightings of the panther-like animal in Mid Canterbury roughly the size of a Labrador dog, with round head and a distinctive long tail. Such sightings began trickling in 1992 when the animal was spotted at the Ashburton River mouth. But the legend really took flight this century when Marcus Ewart and David Tutton reported seeing a large, black panther-like cat near Alford Forest; two years later the cat appeared again, this time witnessed by Peter and Toni May in the Ashburton Gorge. (1) The New Zealand Herpetological Society (NZHS) Frogs NZ New Zealand has four native frog species - Archeys,Hochsetter's, Hamiltons and Stephens Island. All are threatened and all four are in the top 100 of the most evolutionarily distinct and globally endangered amphibians in the world. Check out www.nzfrogs.org for more information. 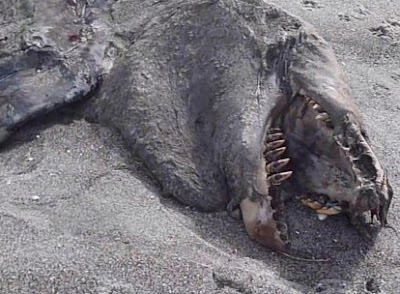 This bizarre-looking 9m-long corpse washed ashore last week in New Zealand, fuelling speculation that it is the remains of a prehistoric sea monster washed up ashore from the deep. This latest “monster” carcass is the latest in a long line of discoveries of bizarre, rotting corpses mistakenly identified as sea monsters or dinosaurs, or even just mysterious “blobsters”. Marine mammal expert Anton Van Heldon examined the latest ‘monster’ carcass in New Zealand and believes it is a killer whale, based on the fin structure. Killer whales, or orcas, are sometimes spotted in the Bay of Plenty. Moose hunter Ken Tustin is about to use updated technology in his bid to capture evidence of the fabled Fiordland moose, despite growing feelings the search may be in vain. The 67-year-old biologist began putting cameras in the bush in 1994 in the hope of photographing descendants of the North American moose released in Fiordland in 1910. Cameras were last installed in 2008, when 13 motion-sensor digital cameras with infrared flash were set up on animal trails near Herrick Creek and Henry Burn, near Dusky Sound. The cameras were now "well past their use-by date" and needed to be replaced, he said. But nearly 20 years after installing the first cameras, Mr Tustin said he was beginning to doubt whether the project was worth continuing. "The job is getting harder and harder because there is quite a build-up of deer in Fiordland now and the forest is opening up, which creates more trails to choose from. "It's becoming harder to know where to put the cameras. Sometimes it's difficult enough to decide which side of a tree to put one on. "I was tempted to flag the mission, but we know far too much about the animal and the use of cameras to give it away so easily." He said his main motivation for continuing was the addictive thrill of the chase and the fear of regret. "I'd hate to end up in an old folks' home thinking, 'Gosh, if only we had just done it for one more season'. "You get the feeling that the next time you go, that it will be the time you get the frame. It would be a shame to give it away now." Mr Tustin said he had received sponsorship to buy new cameras, BF-7s made by Canadian manufacturer Spypoint, which are much more compact and durable. The cameras were powered by six AA batteries, provided better-quality digital photographs, could hold more photographs and had a better trigger distance, he said. "They also have black flash which is invisible - the animals won't even know they've been photographed." He hoped to install them early next month, again on animal trails. The last known photographs of moose in Fiordland were taken by Fred Stewardson, of Hikurangi, who took the pictures on a hunting trip to Wet Jacket Arm in 1953. 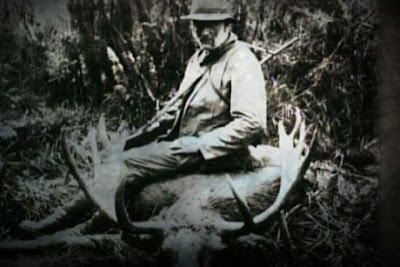 His older hunting companion, friend and mentor Eddie Young, swore him to secrecy for many years, fearing the moose would be shot by hunters if the photographs were revealed at the time. What a Weird Summer. Again! Due to personal and family commitments, I have not been able to do much in the way of posting blogs. Things have however reached a point of unusualness that I felt compelled to write about the unusual happenings which are occurring once again this summer. Now in the summer heat, the southern hemisphere is sweltering under high temperatures, often a lot higher, then previously recorded. Many new records have been broken, for heat. And believe me, it is no fun being in 35°C weather, and like I was last week with a very irritating dose of the summer flu. Our sympathies also go out to those in Australia, our southern hemisphere counterparts who are suffering the worst conditions than we are. We have had a few scrub fires bursts out threatening a few houses, but nothing to compare that frightening scenarios currently running its course in Australia. I wept, for the amount of wildlife that perished in these fires. But here is where things start to get weird again, last year we were inundated with crickets, cicadas and other chirping insects. They were literally everywhere in the garden, venturing at times into the house and hiding among the garden weeds in vast numbers. The sound of the song was a continuing deafening noise would reverberate, both day and night without let-up. This is where a familiar problem arises. This year, there are no crickets, cicadas or any other chirping insects. It was only a couple of years ago, that for some reason insect species such as ladybirds and praying mantises became an absolute rarity, which I have not seen many of this year as well. During this time, if you do not mind me indulging your patience via a flashback to then, we had unusual reports of animal attacks on humans in areas with this wouldn't normally happen. Bats attacking two young men in Rotorua, no doubt drven into the city areas by lack of their natural food, insects. Will we hear more of these occurrences this year; we still have a while to wait, with our hottest month being February. The drought we're currently having is causing havoc for many wetland creatures as at the time of writing. There does not seem to be any relief to the East Coast of New Zealand from this desert like grip which is cruel to man, beast, and plant. Even the usual grass grub beetles never showed up in the numbers that they usually do in November. My friends, we are looking at a totally new world with new seasons and new conditions, and as I do so. I wonder how things will adapt, especially us humans. A 'Lazarus species' is one that is presumed to be extinct and then reappears. 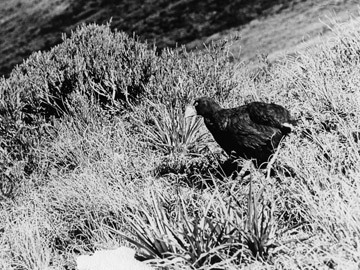 One such example is the Takahē, thought to have died out by 1898. The bird was rediscovered in 1948 by Dr. Geoffrey Orbell, who wrote this article, which was originally published in the December 10, 1948 edition of the Listener, and recently re-published on its website. My interest in the notornis (takahē) began some 30 years ago. I was looking through some old photographs belonging to my mother – a keen amateur photographer – when I came upon a print of a bird in a glass case. My mother explained that it was a picture of the notornis specimen in the Otago Museum, that only four of the species had been found and that it was now supposed to be extinct. That word “supposed” stimulated my boyish sense of adventure, and I read all that I could find about the notornis. As I grew older the call of the outdoors became stronger and stronger. Deer stalking and pig hunting expeditions were frequent. 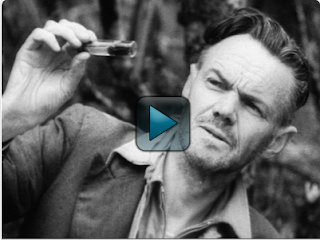 They led me to Beaumont in the Blue Mountains in Otago, where I met Norman Murrell, the State Forest Warden. Mr. Murrell was born and brought up at Lake Manapouri on the fringe of the notornis area, and he heard stories of calls heard in the bush and of blurred tracks on sandy beaches. Once again I turned to Buller and Oliver’s books. In 1929 while on an expedition after wapiti up the north arm of Lake Te Anau I kept a sharp look-out for all bird tracks, but only found those of weka or kiwi. On this trip I made the acquaintance of Charles Evans, then ranger to the Southland Acclimatisation Society. He told a tale of tracks he had seen on a beach in Dusky Sound; of a whole boat’s crew dashing here and there on the beach trying to catch a bird the size of a goose, a bird with blue-green feathers and with the speed of a racehorse. And he told of tracks in the snow-grass and droppings too big for any bird he knew. From hearsay, and from stories told round campfires while stags roared challenges across high valleys, I picked up little bits of information. Then in 1935 I came to live and practise in Southland – and Te Anau was a near hunting ground. Ward Beer, another acclimatisation society ranger, told me of a large blue bird seen on the shores of Lake Ada which he thought might be a pukeko; and from a patient who once lived at Martin’s Bay came the story of a large blue bird seen on the beach there. In 1945 I built a summer house at Lake Te Anau and later on, in partnership with Dr. D.R. Jennings, a 39-foot launch (I wanted to call it “Notornis” or “Takahe” because, as I stated then, I hoped to find the birds some day, but the vote of the families was against the idea, and the launch was christened “Takitumu” after the Maori canoe.) Maps have always interested me and the map of Fiordland was now of particular interest. On wet days and long evenings I would study it on the wall of the house at Te Anau. Notornis? the question was always there, but rarely spoken of, and then only jokingly or as a bait thrown to catch some story. One man who knew Fiordland very well volunteered the information that in one certain area which he would not name, he always carried a hard-nosed bullet in his rifle – the bullet might be worth four or five hundred pounds, he said. But that was just another link in the chain. Studying the map and thinking of the birds, certain facts became clear in my mind. The stories were similar in one respect: all the birds were seen or caught on the beaches below the bush line. And as far as could be ascertained from Buller and from many other reports, all these birds were seen or taken in wintertime, and in years of very heavy snowfall. By plotting all references to the bird on the map it became apparent that there was a vast area of Fiordland surrounded by reported instances of notornis being found or seen – and that piece of country was the least exlored of the whole Fiordland National Park. I heard stories of a large lake seen from the air, and Maori history suggested its existence and also its whereabouts. Deer might be there and as president of the New Zealand Deerstalkers’ Association I had an interest in them too, but the fact remained for the most part that notornis were seen or captured only at low levels in hard winters. We first went into that country on April 11 of this year (1948), the party consisting of Rex Watson, Neil McCrostie and myself. It was very tough going and took over four hours’ climbing to get to the top. Finally we topped a ridge and suddenly found ourselves on the edge of a terrific precipice. Far below us a large lake glistened in the sun, and a valley filled with snowgrass extended three miles beyond it. Through the glasses I sighted a young stag almost directly below us, but the cliffs were so high that he could only just be seen with the naked eye. We scrambled round great overhanging bluffs and rocks and eventually managed to find a route by which we literally slid and scrambled down to the valley floor, where the billy was boiled and we separated to stalk roaring stags. I shot a poor fourteen-pointer and sat down to wait for the others. I was then almost halfway up the valley above the lake and dozing in the snowgrass, when I heard a bird call which I did not recognise – two very long, deep notes repeated twice. I was very tired and I sat and wondered about them. When Rex and Neil returned both accused me of whistling to them over a .303 cartridge case. It was then mid-afternoon and I was in no frame of mind to investigate noises and run the risk of being benighted in the bush. Rather than attempt the awful climb out of the valley we decided to push on and try and get out by way of the gorge below the lake. And on a beach at the bottom end of the lake we found fresh bird tracks large enough for us to be quite certain that they were the tracks I had dreamed about. The sun was already sinking behind the mountains, and we had to hurry to get down through 2,000 feet of bush before dark, so I measured the tracks as carefully as possible by scratching marks on the stem of my pipe – which is practically always in my mouth and therefore less likely to be lost. On our arrival in Invercargill the measurements were quickly put on paper and sent to Professor B.J. Marples, at Otago University. At the same time I compared a duplicate set with all the published evidence available. They matched Buller’s measurements fairly closely and the Rev. C.J. Tocker, who is a keen ornithologist, agreed that they could only be those of a nortonis. Professor Marples, however, was of the opinion that the tracks were too big for a notornis and were probably those of a white heron. Dr. R.A. Falla, of the Dominion Museum, was the next to see the diagram, but he could not reconcile it with any known bird tracks. When all this news came back, my two friends, Rex and Neil, were very despondent because they were all keyed up for a discovery. The news, however, did not worry me, for I realised that, to a man experienced in reading nature signs, a line of fresh tracks on a beach was of far more value than a diagram on a piece of paper could be to the authorities. 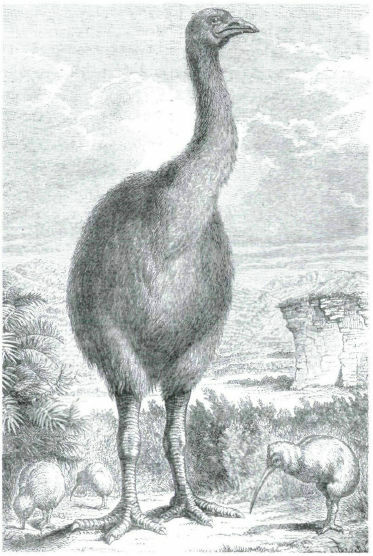 I had in addition the added knowledge that the Otago Museum specimen was a young female and suspected that I had seen the tracks of an adult male; and so it was proved. On November 20, 1948, we once more made the arduous climb back to the valley and on this occasion we were accompanied by Miss J.L. Telfer. This time the only equipment carried comprised cameras and 50 yards of fishing net, which I figured was the best means of attaining our object. Not 20 yards from the the beach where we had seen the tracks I saw the first notornis and my first reaction was to think what a small bird it was. Thereafter our plan of action moved steadily to its successful conclusion. First I took a full reel of colour movie film through the telephoto lens. Then the arrival of the second bird on the scene caused me to take another half reel from a distance of 20 yards. When I stood up the birds were no more perturbed than farmyard hens and only moved a few feet into the snowgrass where the net was quietly circled round them. They walked into it of their own accord. Handling them as gently as possible, we took them to the beach, where they were securely tethered by one leg, photographed, and then released as quickly as possible to the nest which all the signs indicated was near by. The nest, I decided, must be left for another year rather than keep the hen too long from the eggs, or run the risk of driving her away from the nest completely. A third bird was chased half-heartedly towards the bush, where in full view he fed and squawked for nearly an hour. Once having seen notornis sign, nobody with any tracking ability could ever mistake it for anything else and at a later date I hope to be able to untangle the skein of stories about notornis, and show why it has not been seen for 50 years. It has not been because it was not there – it has just been because no one knew just where to look. Click on the image below to watch an episode of the NFU’s Weekly Review newsreel series treks from Lake Te Anau high into the Murchison Mountains, where the team (including naturalist Robert Falla) find sea shell fossils, evidence of moa-hunter campsites, and the dodo-like takahē itself. Strange stories of strange birds and even stranger fossils were coming from the end of the world during the 19th century. The first Europeans spotted New Zealand in 1769 and Captain Cook explored the Northern Island four years later. Cook was very interested in natural history and collected tales about the fauna and flora from the locals. On the Northern Island nothing unusual was reported, however on the Southern Island legends involving a monstrous bird existed. These legends explain an unusual hunting method for a large bird. Hunters would use incandescent rocks, which swallowed by the bird would then burn it from inside. The preferred habitat of these birds was said to be the swamps and forests and according to some legends until 1800 they were very rare animals, but still living on the island. In the year 1823 a hunter named Meurat claimed to have found a bone with flesh attached to it. He assumed by the apparent good preservation that the remains were very recent. Joel Polack, a trader who lived along the eastern coast of the Northern Island, records that during a forced stop of his ship in the Tolaga Bay in 1838 he had been shown “several large fossil ossifications” found near Mount Hikurangi by the Maori in the winter of 1834. 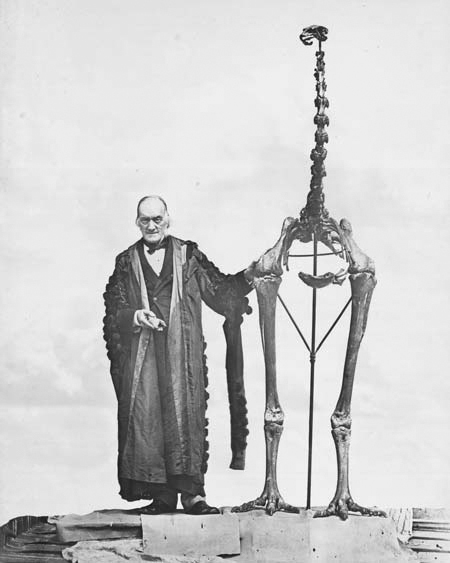 He was certain that these were the bones of a species of emu or ostrich, adding in his report that “the Natives add that in times long past they received the traditions that very large birds had existed, but the scarcity of animal food, as well as the easy method of entrapping them, has caused their extermination“. Polack further noted that he had received reports from Maori that a “species of Struthio” still existed in remote parts of the Southern Island. The German naturalist and geologist Ernst Dieffenbach also refers to a fossil from the area near Mt. Hikurangi and reports that it belongs to “a bird, now extinct, called Moa* (or Movie**) by the natives”. He continues “On questioning the natives, as I usually did, relative to the natural history of their country, I heard a curious tradition connected with the totara-tree in the neighbourhood. Near this tree they said their forefathers killed the last moa. From the few remains of the moa that have been found it has been declared by Mr. Richard Owen to be a struthious bird of large size." Read the whole fascinating piece by David Bressan over at his Scientific American blog. You'll be surprised where this story ends up!